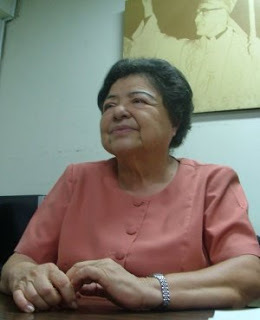 María Julia Hernández was a philosophy professor at the University of El Salvador in the 1970s, remembers Ovidio Mauricio Gonzalez, current coordinator of Tutela Legal “María Julia Hernández,” [the Legal Protection Office that bears her name]. Along with the team of Tutela lawyers, Gonzalez has inherited an ethic of dedication to the defense of the country’s most vulnerable people. Gonzalez spoke about these and other themes in this exclusive interview with Diario CoLatina. I met María Julia in 1989 when she was already the director of Tutela Legal, and I came to work with her. But the first time we came into contact was around 1978 when she was my professor, teaching general principles of philosophy at the National University of El Salvador. What was María Julia like? [Laughs] Well, the first impression we had of her as our professor was of her knowledge. At first, we all said she was “yuca”—very demanding. She was a person with a deep understanding of philosophy, and maybe she thought we were as advanced in our knowledge of these concepts, because she condensed these broad topics and we had to work to keep up with her in our studies. And then the term was over and I didn’t see her again until I got to Tutela Legal in San Salvador. How did you come to work at Tutela? María Julia called me to support her work in Tutela Legal after I resigned my job at the Attorney General’s Office, where I had been a special prosecutor. She wanted someone with experience in criminal cases, she called me, and I came—but I was afraid. Because at that time it was risky to defend human rights in this country. Beyond that, I came from doing battle in litigation, but failing because the justice system was, and is, corrupt. The few victories we did achieve were imperfect, small victories negotiated and divided with the other parties at court. And this kind of thing still goes on. So, I decided to take a chance on working in human rights. How did you delve into your new work? The truth is that it was an unknown area for me. The subject of human rights is still not taught at the university—it’s an unknown subject—and I remember María Julia telling us “we absolutely have to learn, urgently and quickly” because the situation demanded it. Just as María Julia was working constantly and with great commitment, all of us there were also working, as they say, “24/7”. That is, you had to be on alert every day, at any hour, to take calls from victims or complainants because in that era, human rights work was going on every day. There were kidnappings, disappearances, assassinations, tortures, and murders of disappeared persons. Which Tutela cases do you consider most emblematic? The massacres, like El Mozote, La Quersera, El Sumpul, the case of Monsignor Oscar Romero. I remember very well that one of my first cases was an investigation of a dynamite attack against FENEASTRAS [the National Syndicate of Salvadoran Workers] on October 31, 1989. I took photos of the site and got information from some of the witnesses. All that material ended up in Tutela files—photos and statements about the destruction caused by the bomb. I was with Alfonso Hernández that day, who was second-in-command to María Julia at that time. I remember I took a very clear statement from someone who testified about seeing someone leave a suitcase in the community kitchen and everything that happened in the FENASTRAS case. How did you approach the cases you investigated? We would go to the site where the incident happened, and sometimes we’d meet people who gave us testimony. We took photos as evidence, and sometimes other witnesses, or the victims themselves, would come to the site and give us names and pieces of information—things they had seen themselves or heard from those who had been affected. What was María Julia’s style of work like at Tutela Legal? It was ambitious work. We’d go to the scene of the event to analyze the situation and find out if we could work there. Then there was compiling the testimonies and determining if they made sense. In order to take statements, we had to gain people’s confidence and give them enough time so they could provide the most exact account of the events that they could. We also had to analyze what we were collecting, comparing one statement with another. We always went to the first proceedings in court to compare that information with ours and see if it lined up with our testimonies. We even compared our information with what was published in the newspapers, and we realized that a lot of information was misrepresented; there was complete misinformation about the facts. How did the police authorities, prosecutors, and judges treat your cases? It was a negotiation. There are still prosecutors working against those who defend human rights, who have a certain reticence toward our work. In contrast to the way they dealt with the journalists, they denied us information—they gave journalists information but denied it to us. In those days, the courts allowed law students and lawyers who weren’t part of the process to see the judicial files, so this allowed us to do a lot of analysis of the content of the cases. We were able to see how the medical examinations had been done, if there was an autopsy or not, and whatever other kind of evidence had been obtained. What was the environment like, for you as human rights defenders? It was intense. María Julia was well informed on all the cases, as was Monsignor Arturo Rivera y Damas, who stayed on top of all the information that came out in the newspapers as well as the accusations that were personally presented to him. In the cases against the Armed Forces and the guerillas, Monsignor Rivera would say to us, “Let’s investigate,” and sometimes we had to go the very day the complaint had been made in order to do the investigations. How do you see María Julia’s contribution in the field of human rights? She has left a great legacy. She always demanded objectivity and a scientific approach—one of the clear examples of her work was [in the case of] the massacre at El Mozote. This was one of the first cases where Argentine forensic anthropologists worked to analyze the remains of the victims of this 1981 massacre. This was one of María Julia’s great struggles—to have them incorporated into the process. I remember that neither the Supreme Court of Justice nor the tribunals themselves were open to this kind of expert opinion, and they had to come to terms with it because they were pressured by the United Nations. The ONUSAL [United Nations Observer Group in El Salvador] was there at that time, and thus the results of the analysis done by the forensic anthropologists were accepted. Was that a big jump in the quality of the investigation? Yes, it was a leap in quality, and I remember that Juan Matheu Llort, the director of Forensic Services at the time, was opposed to the process, as was the presiding magistrate of the Supreme Court of Justice, Mauricio Gutiérrez Castro. They were absolutely opposed, but in the end they had to comply because of international pressure. What was Tutela Legal’s role in the case of the Jesuits? María Julia was among the first to arrive on the scene, and the iconic photo of her and the bodies of the Jesuits was taken by members of Tutela Legal to document that fact. That picture went around the world. This was the kind of evidence we would collect on the scene, and in accordance with the witnesses and with what we had seen there, we would even make diagrams of the scene where we would indicate places, positions of bodies. This allowed us to build our cases well. In the case of the killing of young Adriano Vilanova Velver (1995), the son of a doctor, we managed to construct a scale model of the scene in order to determine if he had really been killed in a traffic accident, or if it was murder. And this made it possible to question the story the police were putting forward. It was one of the few cases in which this reconstruction technique was put to use. How did the case of Monsignor Romero affect María Julia? The case impacted her because she knew him. By the time Tutela Legal was founded by Monsignor Rivera y Damas on May 3, 1982, Monsignor Romero had already been assassinated, but she was still interested in the investigation of the case. Monsignor Rivera also asked for an investigation of the killing. There is a statement in the proceedings where Monsignor Rivera declares that he is insulted and asks that the assassination of Monsignor Romero be investigated. It’s totally clear in the petition, and also in the statement before the Inter-American Court of Human Rights. We never saw the other bishops do anything like that. However, as we know, the case was simply closed by the Amnesty Law in 1993 and nothing more could be done. How did María Julia deal with all these obstacles? How does Tutela Legal “María Julia Hernández” approach its work? We want to preserve everything she taught us. Her work ethic of committing to the extent that it’s “almost” volunteer work, but on behalf of those vulnerable sectors [of society]. This is what we attempt to do, and, clearly, we also have our own need to maintain the structure of Tutela Legal and to be an example, as she taught us. On Friday the 23rd, we [had] a religious service in her memory to pay homage to someone who strove to make human rights triumph in this country.